One of the best delights of the autumn season are the fall blooming bulbs (we'll call them bulbs as a general term, but some come from corms, rhizomes or tubers). Blooming at the time of year when things are beginning to look a bit tired in the garden, these flowers arrive just in time to revive it for the new season. With careful selections, your autumn garden will rival your spring garden for color and charm. Tuck a few of these beauties into spots where you can appreciate them. And don't forget where you planted them, so you won't dig them up accidentally, because some of them will erupt suddenly from the ground on long stalks, blooming long after the foliage has withered and died, taking you completely by surprise, but that is part of their charm. Many of the fall blooming bulbs originate in South Africa or South America where they go dormant during the hot, dry summers and awaken with the late summer and fall rains and they do best in areas where those conditions can be duplicated as closely as possible. Allium tuberosum, garlic chives, Zones 4-8. 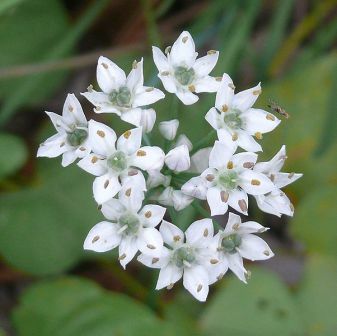 The white starry flowers of garlic chives are showy, and this relative of culinary chives (Allium schoenoprasum) is easy to grow from seed and quickly forms clumps and little bulblets that can be divided. They make a nice edging in the herb or perennial garden. The dried seed heads with their black seeds are also ornamental. Amaryllis belladonna, naked ladies, Zones 7-10. These gorgeous flowers, relatives of the common amaryllis grown as a potted houseplant (actually Hippeastrum), arise from leafless stems in shades of pink in fall. After bloom, the large strappy leaves appear and remain until summer. Sweetly scented, too. Plant these fall blooming bulbs in full sun in well-drained soil. Usually thought of as spring flowers, crocuses have fall-blooming species, too. 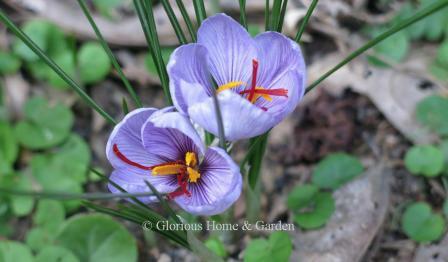 In fact, Crocus sativus, which provides the spice known as saffron from their orange-red stigmas, blooms in the fall. You'd have to grow a lot of it to harvest your own saffron, but it's a fun one to try! Crocuses grow from corms, and you should plant the corms of the autumn-blooming types in the late summer as soon as they are available, in a sunny, well-drained location. 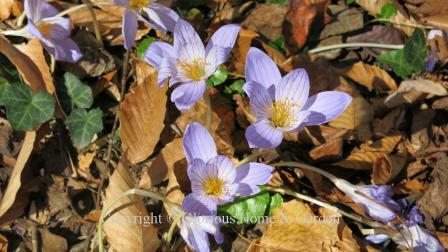 Here are a few of species of fall blooming crocus. They deserve to be used much more widely than they are. Crocus banaticus, Zones 3-8, lilac. Crocus goulimyi, Zones 3-8, lavender. Crocus kotschyanus, Zones 3-8, rose-lilac with a yellow throat. Crocus niveus, Zones 5-8, white. Crocus sativus, Zones 5-8. The saffron crocus is purple-mauve with striping inside and long red-orange filaments (stigmas) that are harvested as a spice. The yellow stamens are not used. Crocus speciosus, Zones 3-8, blue-lavender with branched red-orange stigma. 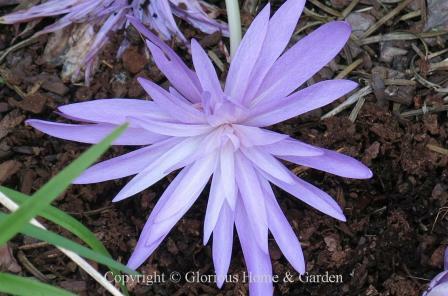 This one is known as the showy crocus and several cultivars have been developed. Colchicums look very similar to crocuses, but these fall blooming bulbs may be even more beautiful. 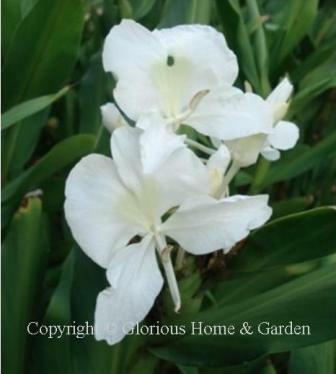 It is a delightful surprise when the naked stalks arise topped with lovely blooms of white, pink, rose or purple. The foliage emerges after bloom and disappears by early summer. They are best planted among foliage plants, under trees or in grass where they can be left undisturbed. They are beautiful en masse. Plant the corms as you would autumn crocus in late summer as soon as they are available in a sunny, well-drained location. Colchicum autumnale, Zones 4-9. Flowers of lavender pink have a tendency to flop over so plant among supporting ground cover foliage. Colchicum autumnale 'Album'--a white form. Colchicum byzantinum, Zones 5-8. About 6-12 lavender pink flowers with a paler center stripe that gives a star effect bloom on naked stems in fall and the broad leaves appear in spring. Colchicum speciosum, Zones 4-9. Known as the showy colchicum, this species has larger flowers than C. autumnale, and blooms a little later in a deeper shade of purple-pink. Colchicum X 'Waterlily'--a beautiful double-flowered purple-pink hybrid. 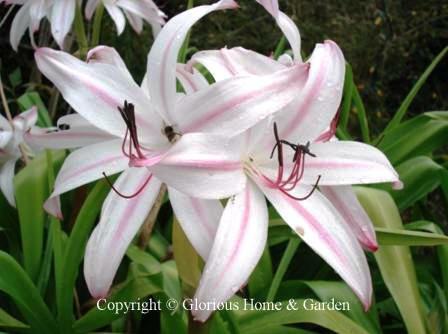 Crinum lilies are in the amaryllis family and grow from a similarly large true fall blooming bulb. They are truly spectacular in the late summer/early fall garden. Unlike Amaryllis belladonna, the crinums bloom with their leaves in place and they do make a large mass of foliage--needed to support the large bulb--so they need a lot of room. Crinum x powelii 'Royal White' is pictured. Zones 7-10. Another lovely fall blooming bulb flower to try is the hardy cyclamen. There are cyclamens that bloom in the spring, and tenderer ones that are used as houseplants (C. persicum). 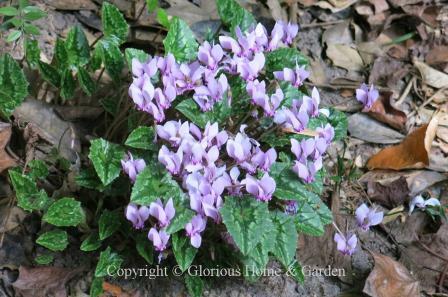 The best and hardiest for naturalizing in the garden for fall bloom is Cyclamen hederifolium. The flowers can vary from white to a deep magenta pink with beautifully mottled heart-shaped leaves. Plant them under trees and let them peek through the newly fallen leaves. If they are happy they will both self-seed and increase from tiny cormlets and become naturalized and soon you will have a glorious sight in your garden indeed! Best to plant them where they can be left undisturbed. They will do best in Zones 5-7, and they must have good drainage or the corms may rot. 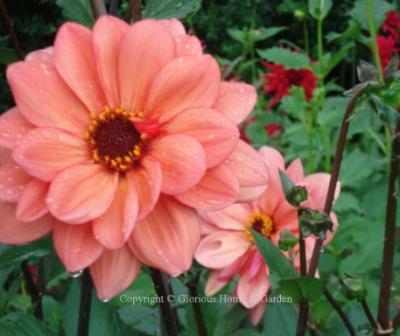 Dahlias are a highlight of the fall garden--at least in areas with low humidity and cooler temperatures where they do best, and will bloom until frost. Then the tubers must be dug and stored for the winter. Their clear, bright colors, in so many shapes and sizes are so tempting, that they are at least worth a try for the rest of us. Hedychium coronarium, ginger lily, Zones 7b-11. One of my favorite fall blooming bulbs (actually rhizomes) here in the South, is ginger lily. The blooms look like butterflies, the fragrance is outstanding and they bloom for a long time. In areas where they are not winter-hardy, the rhizomes can be dug and stored until spring. Lycoris radiata, spider lily, Zones 7-10. 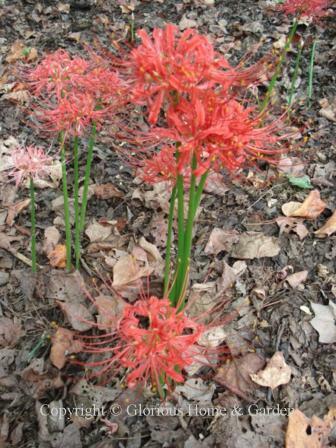 Spider lilies, or red spider lilies, are an old-time favorite. 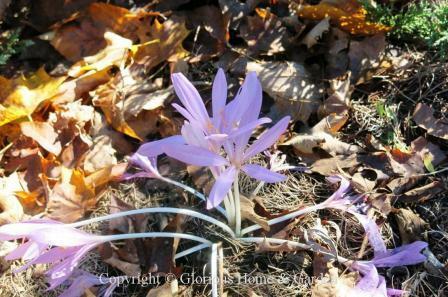 These fall blooming bulbs are a delightful surprise when they emerge on bare stems in late summer into fall. The flowers radiate as their name suggests in a circle at the top of the stem and the long stamens give them an airy, ethereal look. The leaves appear after the blooms and disappear by summer. Enchanting! Plant them where you won't dig them up--under a ground cover is good. They like hot, dry summers and then good rain to wake them up in the fall. There is also a white one, L. radiata var. alba. Nerine bowdenii, nerine, Zones 8-10. An amaryllis relative native to South Africa, nerines are beautiful fall blooming bulbs for the autumn flower garden, but are best treated as a container or greenhouse plant where they are not hardy. The pink flowers rise on bare stems in fall rather like a lycoris, after which the leaves appear and the bulbs go dormant for the summer. There are several species, but N. bowdenii is the most cold hardy. Sternbergia lutea, lily-of-the-field, Zones 7-9. A member of the amaryllis family with golden crocus-like flowers, these fall blooming bulbs should be planted in well-drained soil in full sun. Like a lot of summer dormant bulbs, they prefer a hot, dry location. 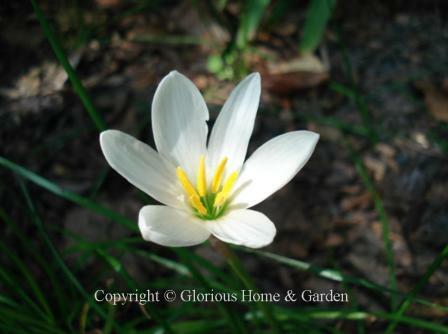 Zephyranthes candida, rain lily, Zones 7-10. Pure white rain lilies with bright yellow stamens are a delightful surprise. Their grass-like foliage is neat and tidy and they burst forth into bloom in late summer lasting well into fall after the onset of a good rain. Use these fall bulbs for border edgings, in groups or as a ground cover.